It's hot, middle of summer, everyone's out on their porches thinking about life. Longer version includes Baptist Church service music (better version). 3:30 and 6:45 Never Aired. PRX premier. 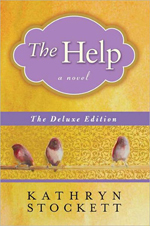 Author Kathryn Stockett and "The Help"
Kathryn's debut novel, "The Help," is a black-white history lesson that's never been told quite like this before. Through the lives of several women in Mississippi, it chronicles the civil rights movement in the American South in the early 1960s. Though Kathryn's book has been on bestseller lists for longer than most any other hardcover fiction title, made into a movie and published in 37 countries, as she explains in this interview, she didn't have an easy start as a writer. Andrew McLindon talks about his Family Foundation's mission of giving adaptive bikes to kids, teens, and young adults. Mina Thorgeson, from Ridgeland, MIssissippi's tourism center tells us about her city, the amazing options for cyclists, and invites us all to come down and join the 24,000 welcoming residents. Then, we talk with director/product Frekrik Gertten who film, Bikes vs Cars, is screening worldwide to much acclaim and interest. We begin in Baton Rouge, LA with Andrew McLindon . Andrew is the head of the McLindon Family Foundation and their work is dedicated to special needs children, teens, and young adults. Starting in 2008 with their first bike for a young boy with hydrocephalus, , they now have a waiting list in the hundreds. And, after a piece aired on NBC’s "Making A Differenc e " on the evening news, not only is there a growing list of those who want and need a special adaptive bike; but, there has been an outpouring of support from individuals, “teams” of people, manufacturers, and more. Then, we head on down to Ridgeland, Mississippi to speak with Mina Thorgeson . I met Mina in Cincinnati at Recumbent Cycle-Con and she was so interesting, enthusiastic, and fun that I needed to know more about her work and her city. Ridgleland is a small city of 24,000 people – but, it sports 140 restaurants, a 30,000 acre reservoir, hosted a tandem rally last year, and is situated right next to one of the most popular riding routes in the south - the Natchez Trace. Ridgeland welcomes cyclists and their families and offers great southern hospitality. After some quick news and a break, I take the microphones over to Sweden to speak with film producer and director Fredrik Gertten . Fredrik’s documentary movie, “Bikes vs Cars ” is touring the world right now to huge acclaim and enthusiastic audiences.